Civil Engineering Materials explains why construction materials behave the way they do. It covers the construction materials content for undergraduate courses in civil engineering and related subjects and serves as a valuable reference for professionals working in the construction industry. The book concentrates on demonstrating methods to obtain, analyse and use information rather than focusing on presenting large amounts of data. Beginning with basic properties of materials, it moves on to more complex areas such as the theory of concrete durability and corrosion of steel. Explains what material properties such as specific heat, thermal conductivity and electrical resistivity are and how they can be used to calculate the performance of construction materials. Contains numerous worked examples with detailed solutions that provide precise references to the relevant equations in the text. Includes a detailed section on how to write reports as well as a full section on how to use and interpret publications, giving students and early career professionals valuable practical guidance. 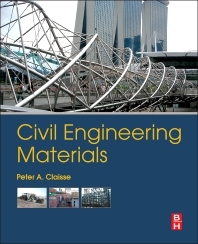 Peter A. Claisse is a professor at Coventry University and the author of more than 100 publications on construction and materials.